This lodge is ideal for corporate retreats, weddings and gatherings. It is a superb spot for 2 to 3 families wishing to share accommodation while enjoying all that Fernie has to offer. A unique soapstone fireplace or “Tulikivi” is located in the living room and features a “Forno”, or oven. The dining area has a large custom dining table made of larch and seats up to twelve guests. The wrought iron work and the recycled materials add a sense of history and warmth. Original artwork throughout the home along with historical photos of Fernie and the ski hill emphasize the beauty of this home. The kitchen is a gourmet’s delight; featuring granite counters, gas range with convection oven, fridge, dishwasher, blender, microwave, coffee maker, with an abundant supply of pots, pans and dishes. Cook for yourself or arrange for a chef to come in and create a dining experience for you and your guests. If you are looking for the most spectacular home at Fernie Alpine Resort, look no further. We are CaliFernians, ie. Calgarians that commute to Fernie for recreation in the mountains. In the 80's we lived in Canmore (near Banff), but usually travelled to Fernie on winter weekends to enjoy the powder skiing. From 2000 to 2004 (yes it took a long time to build!) we built Kimbers Timbers. Fernie is a great get away from the city. For more information please look for and click on the link to our personal website. We built Kimbers Timbers. Fernie and Fernie Alpine Resort are special mountain places. The best access to the ski hill is right out the front or back door of our chalet. When the ski season ends we have the mountain to ourselves and the wildlife! Summertime is so green and pretty. Best location on the mountain for ski in and ski out and yet private. 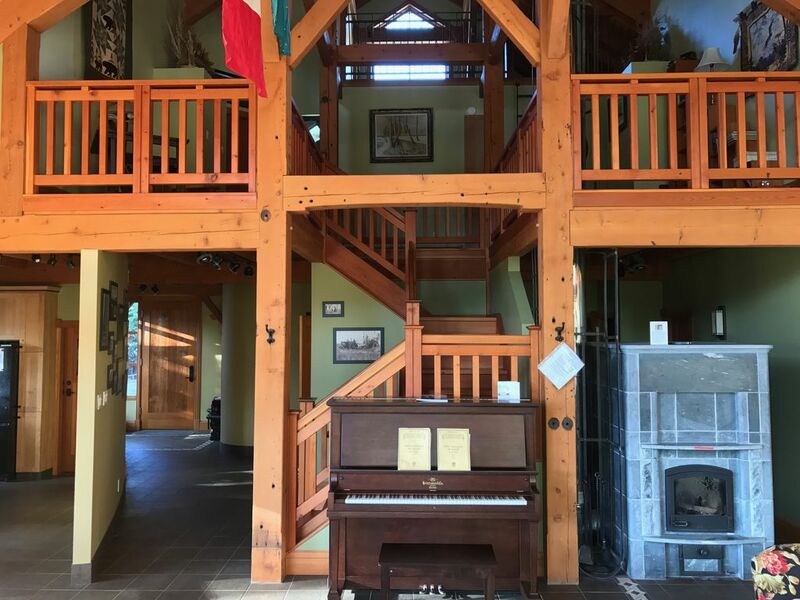 This one of a kind, true timber frame home was built by hand with love and skill from reclaimed materials from the surrounding area. With stellar mountain views and a super convenient ski-in/ski-out location, you will not be disappointed. The home is incredibly well organized with plenty of gear storage in the garage/mudroom and well stocked throughout. Soaring ceilings, picture windows and intimate gathering spaces are perfect for spending time with friends and family. The kids will enjoy the foosball table in the garage as well as the nooks and crannies for snuggling in with books and games. The covered outdoor hot tub is the perfect spot to unwind after a day on the slopes. The unique European wood-burning stove will keep you cozy while you share unforgettable memories with your loved ones. The large dining table with a view is perfect for big group dinners and the spacious bedrooms and 3 bathrooms work really well for several families. From incredible cat skiing adventures to the down-home experience of attending a local hockey game to fantastic restaurants and of course the legendary Fernie pow, Kimber‘s Timbers is the perfect place to enjoy all that Fernie has to offer. The hosts are lovely and incredibly humble, gracious and accommodating. We have been making the rounds to the BC ski areas including Sun Peaks, Silverstar, Revelstoke, Big White, Red Mountain and now Fernie and our Fernie experience was second to none. I highly recommend Kimber’s Timbers for your unforgettable Fernie experience. Thanks for the positive feedback. It was nice to meet you. A special thanks for treating our place with respect and leaving it nice and clean. Hope you will come visit us again. Kevin G.Where do you live? Truly ski in and ski out. The owners paid attention to all the details. Staying in this home was like staying in your own home. Would go back in the heartbeat. Thanks Kevin. Glad you liked our place. You are welcome to return any time. Sorry we couldn't provide more powder snow this time around. Amazing cabin perfectly located on the hill. It was the perfect size for a multi generational family get together. Kim helped us to feel exceptionally welcome. Great house and reasonable owners, and you can actually ski to the doorstep and down to the lifts! We had a group of 8-12 depending on the night and were comfortable in all cases. The hot tub, large dining table, and gear/boot drying room were also highlights. Great house makes for a fabulous vacation. Simply doesn't get any better than luxury accommodations right on the hill. Our group of 5 couples thoroughly enjoyed our time at Kimbers Timbers. House definitely made up for the lack of fresh snow by being a place we were very happy to be in when not out on the slopes. Being on the hill is a must for a large group of people with different interest levels in skiing. First runs for those that want, sleeping in for others, rendezvous at lunch time for everyone and relaxing evenings by the fire or rousing games of foosball to settle scores. Easy to spend a full week in the house if fully provisioned yet quick and easy enough to get into town for supplies or some boutique shopping. Kimbers Timbers is always at the top of our list when looking for a place to stay in Fernie, any season! Thanks for the positive comments. Wish you could have had the snow that fell the week after your visit! Kim and Jane have created the perfect ski chalet. Super simple, super enjoyable. Great views, excellent kitchen and lovely aesthetic. Couldn't recommend more highly. Family members have allergies so we are a No Pet and No Smoking property.